We never wanted to live in an Airstream until now. It’s true that tiny mobile homes have long been havens for crossy-country travelers, but no vehicle sums up the Americana adventure quite like the Airstream. The iconic silver bullets, which became instant symbols of easy, nomadic living when they first arrived on the scene in the 1930s, have been making a much-welcomed comeback lately. And thanks to innovative renovators and designers—like Kate Oliver and Ellen Prasse, the wives-turned-business partners behind The Modern Caravan—the vintage vessels are getting a fresh, 21st-century facelift. After deciding to trade their nine-to-five jobs for a life on the road three years ago, the pair made flipping retro caravans into tiny, contemporary retreats, their full-time gig. To date, the couple has renovated six Airstreams: three for clients, and three for themselves. A mod vision in pink, their latest fixer-upper (dubbed “isla”) might just be their most stylish transformation yet. Created for clients Chris and Page, a young couple who, after a three-year stint in Puerto Rico decided to switch gears and explore North America by Airstream, Kate and Ellen wanted to design a caravan that would, literally and metaphorically, fuel their inner-wanderlust. If you’ve ever been one to wonder whether a residence-on-wheels can actually feel like a real home, this mobile retreat’s inspired interiors will put your questions to rest. While Chris and Page’s “needs” for their new home-on-wheels were pretty basic (the couple wanted a full bathroom, king-sized bed, accessible storage, and a functioning kitchen), the remodel proved to be Kate and Ellen’s most challenging yet. Repairing the large gaps between the skin and windows, waterproofing the Airstream, and polishing the exterior were just a few tasks on their to-do list. In the end, they were working through the holidays in order to complete the space a month and a half later than they had originally anticipated. Contrary to popular belief, square footage and style are not mutually exclusive. 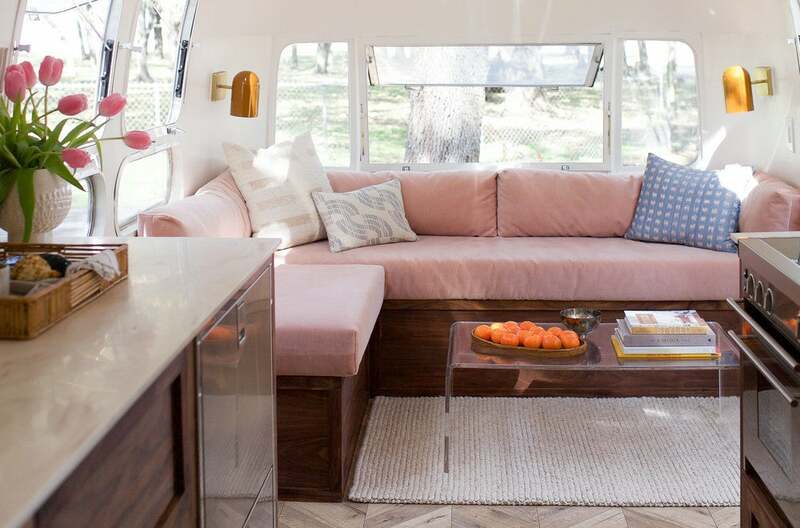 A refuge for natural sunlight, the velvet blush pink seating that earmarks one end of the Airstream packs more style than most average-sized living rooms will ever see in a lifetime. Dark wood detailing, an acrylic coffee table, and mustard-colored sconces complete the ultra-modern scene. The same earthy tones that strike the living room effortlessly envelope the kitchen. Decked out with rich walnut cabinetry, a custom-fitted sink, Fireclay tile backsplash, and solid corian countertops, the teeny cookhouse feels charmingly rustic, yet undoubtedly of-the-moment. “I am always and forever in love with desert palettes, and we’re currently in Arizona for a renovation project, so I have a constant parade of inspiration out my front door, especially at sunset and sunrise,” says Kate. In the itty-bitty bathroom, Kate and Ellen installed a custom tiled shower and a generous vanity. An added bonus? Depending on where Chris and Paige decide to park their mobile residence (overlooking the Grand Canyon? Along the Pacific coast? ), the couple can soak in stellar, unfamiliar views while they bathe. Something you’d only ever expect to find in a spacious, stationary abode? Peep the herringbone floors. The patterned floorboard design not only helps tie the living room, kitchen, and master suite together, but gives the vintage Airstream its contemporary edge. Be it a 100-something square-foot apartment, eco-friendly hut, or, in this case, a retro caravan, no smaller-than-average home can make do without ample storage. Taking full advantage of every nook and cranny, the sleek built-in wardrobe, which lines the hallway leading toward the bedroom, offers extensive room for the couple to hang, organize, and stash their daily gear. “When deciding on what storage to incorporate in a tiny space, the first rule is accessibility: if you can’t easily get to your stored items, there’s really no point in having the storage,” explains Kate. If given more time, Kate notes she would have liked to wallpaper the interior of the closet “something deep, dark, and floral” for an added pop of color. Despite being tight on room, the serene, whitewashed dwelling makes way for bedside storage. The trick to living small? Compromise, but don’t forgo the things that make you you. Feeling motivated to hit the road yourself? You can keep up with The Modern Caravan’s latest projects and adventures on Instagram, or peek inside Kate and Ellen’s current home for more tiny home inspo.